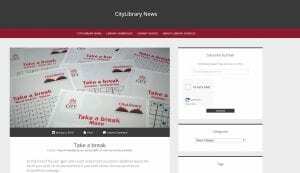 To keep up to date with what’s happening across Library Services why not subscribe to CityLibrary News? We regularly post stories on topics such as brand new online resources, the latest textbooks purchased, campaigns like Take a Break and service updates, e.g. on our opening hours or bookable study spaces during the exam period. Plus we’re always interested to know what you think, so you can send us your comments and questions on any of the news items we publish, or suggestions on any topics you want to read more about.